Award-winning author Alan Bradley returns with another beguiling novel starring the insidiously clever and unflappable eleven-year-old sleuth Flavia de Luce. The precocious chemist with a passion for poisons uncovers a fresh slew of misdeeds in the hamlet of Bishop’s Lacey—mysteries involving a missing tot, a fortune-teller, and a corpse in Flavia’s own backyard. Alan Bradley is the internationally bestselling author of many short stories, children's stories, newspaper columns, and the memoir "The Shoebox Bible." His first Flavia de Luce mystery, "T"he "Sweetness at the Bottom of the Pie, " received the Crime Writers' Association Debut Dagger Award, the Dilys Award, the Arthur Ellis Award, and the Agatha Award, and was nominated for the Macavity, the Anthony, and the Barry awards. 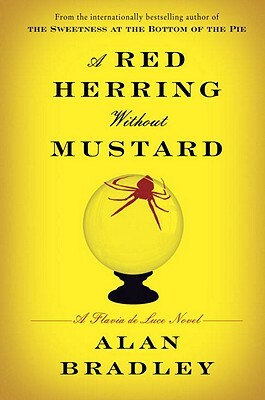 His second Flavia de Luce mystery is "The Weed That Strings the Hangman's Bag." Bradley lives in Malta with his wife and two calculating cats, and is currently at work on the next Flavia de Luce mystery, " I Am Half Sick of Shadows."